NOTE: The B.C. Provincial Command Colour Guard has been suspended by Command from marching in events supposedly due to the lack of members physically able to march as they do not consider Colour Guard members unable to march due to age or impairment members any more. The Army, Navy & Air Force Veterans in Canada (A.N.A.F. ), hold the distinction of being the oldest Veterans organization in Canada. The Association’s history is closely identified with Canadian tradition. Documented evidence shows that this Association was in existence in the city of Montreal in 1840 under the title of Army and Navy Veterans in Canada. The Colour Guard is especially proud to celebrate our Association’s 173rd anniversary this year. Because of the seniority of our existence, the Army, Navy & Air Force Veterans in Canada, B.C. Provincial Command Colour Guard normally leads all parades in which we are entered. This B.C. Provincial Command Colour Guard is comprised of volunteers from various Units throughout the Lower Mainland. Each year we participate in 15 to 18 Lower Mainland area parades including the Tsawwassen Sun Festival, Steveston Salmon Festival, Pitt Meadows Days, Hyack International Parade, Cloverdale Rodeo Parade, Port Coquitlam Rotary May Day Parade and Hands Across the Border. In the past, we have joined forces with the Interior contingent of the BC Provincial Command Colour Guard at the Annual Peach Festival in Penticton. The Colour Guard is under the leadership of Colour Sgt. Robert (Bob) Rietveld. Previously we were judged the “Best Marching Unit” in the Maple Ridge Mountain Festival Parade. Last year we took 1st place in the Association Marching Unit Category, in the Hyack Festival of Lights Parade in New Westminster. 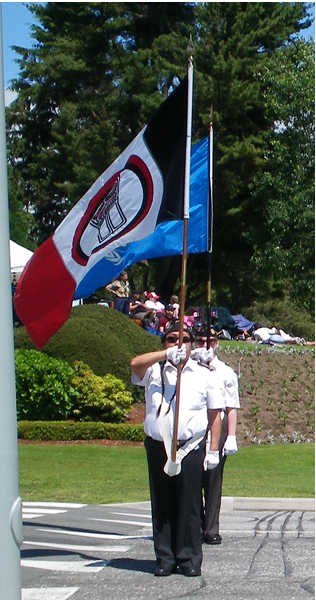 The Colour Guard has appeared for several years at the Vancouver Canadians season opening and closing ceremonies. We are proud to carry our National, Provincial, Army, Navy & Air Force & Association flags representing our Veterans across Canada. We are also fortunate to have one of our First Nations members carry the flag of her Nis’gaa Nation, representing the contributions of our First Nations Veterans. Army Navy & Air Force Veterans in Canada, BC Provincial Command Colour Guard is comprised of volunteers from various A.N.A.F. Units throughout the Lower Mainland. We are a non profit organization dedicated to providing support to our Armed Forces Veterans and their families.